Manufacturer of a wide range of products which include industrial elevators and belt elevators. Our organization is counted amongst the most distinguished providers of Industrial Elevators. Made up and designed with excellence, we offer these in numerous sizes and stipulations to our clients to suit their necessities. These elevators are the most economical and efficient way for elevating loose bulk materials. The initial cost for the elevator is low and required maintenance is minimal. We are the best manufacturer, trader, and supplier of the high quality of Belt Elevators. Our manufactured belt elevators are low maintenance products. 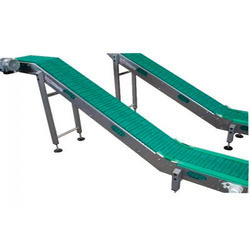 Our Belt Elevator is durable and can withstand the weight of the heavy material. As a prime manufacturer of Belt Elevator, we ensure that our products are served to the clients within committed timelines and at competitive rates.